The great Alaska Range encompasses the 400 mile-long mass of mountains running across the state east to west, effectively cutting atmospheric weather patterns in half, dividing the settled colder air of the north from the warmer moisture generators of the Pacific. Weather patterns ebb and flow across this line. The Kichatna Spires are like a whistling gunsight notch: gusts seem to get magnetized here, funneling through a group of particularly pissed granite towers. 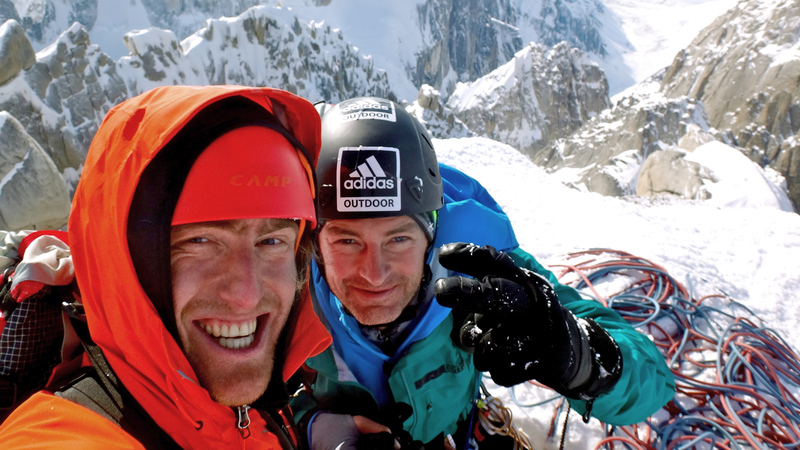 Five seasons ago, when Jess Roskelley and I first climbed here, we noticed an immense ice to big-wall line on one of the granite spires, and we'd been keenly watching the conditions ever since. Merely approaching it, however, would require using a lightweight cloth-skinned bush plane equipped with fat powder skis to land and turn in the 100 feet of solid, level ground in the upper glacier. Below this lone flat spot is a jumbled mess of erratically strewn car-sized boulder pillowed in by winter snow. For the better part of March, I waited at my small cabin in Palmer, an hour from a runway, warming myself by the wood-burning stove and watching meteograms for a split in the classically horrid Kichatna weather patterns. The forecast remained apocalyptic for weeks. At last, we spotted a twelve-hour window, and we flew in to check on the conditions and to attempt to open the landing. Our talented pilot Ken MacDonald charged the little craft across the wide Susitna Basin toward the Spires. The plane made several spiraling circles, losing elevation through the tight-walled cirque, until we were in line with the level pocket of a runway at the head of the steep, tossed glacier. The landing was full value, requiring technical flying to approach and demanding perfect conditions, but repeatable given the window. We stood in the supportive snow at the base of the ice route and craned our heads to glass the whole thing. It worked: we were in. Then the storms returned from the Pacific. I drove back from Talkeetna to Washington, where Jess and I had plenty of work that needed to be done with our welding business. We continued comparing several forecasting models a dozen times a day. For two weeks, persistent patterns socked in the Spires. As soon as we saw the freeze/thaw cycles that we wanted, we were on the next flight back north. However, all the precipitation in the high mountains meant rain at lower elevations, and the essential snow runway had melted out. Our main project would have to wait until another season. On the successful reconnaissance, however, I'd photographed another line that Jess and I had been aware of since we made the first ascent of the Hypa Zypa (VI 5.10 R A3 AI5+ M6+, 3,700) on the east face of the Citadel from the Shadows Glacier. The two lines would meet each other some 300 feet below the summit and come from opposite sides of the mountain. No previous routes had been completed on the west face. Josh Wharton and Zach Smith had attempted a line there in 2008, but they retreated after Wharton took a lead fall, ripping gear and injuring Smith with his flying crampons. Jess and I planned a completely different route to the immediate left of their attempt. We flew in with Talkeetna Air Taxi to the Cul-de-Sac Glacier. On the first few pitches, Jess led sections of overhanging rock. 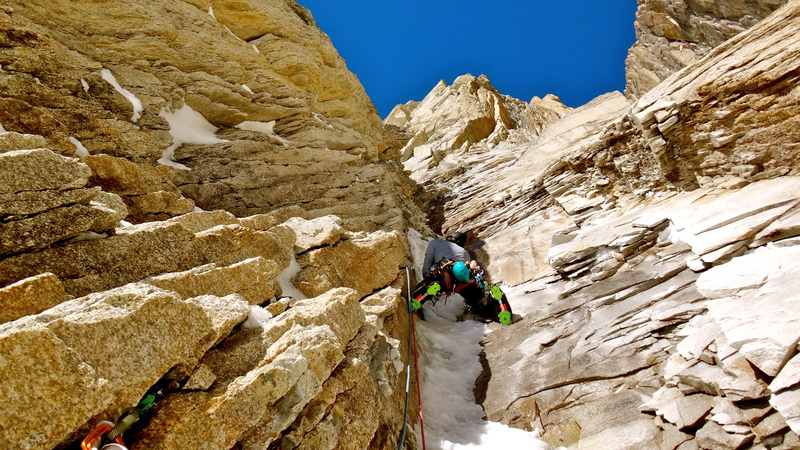 Midway through, a foothold blew out and a large flake of rock sawbladed down the pitch and past the belay. Jess managed not to fall. I laughed as I thought about how Jess can tiptoe on hard ice and mixed terrain without mishap, but two days before we rushed up here, he'd slipped on the wet tile of the bathroom floor and split his head, requiring a half-dozen stitches. Classic. We fixed out our two 8mm ropes and then rappelled to the ground in the acute Alaskan light. Consuming a generously rationed dinner, we ate for the hunger to come. There wasn't much sleep that night: we started climbing again at 3 a.m. After regaining our highpoint, we continued up the lower rock wall through leftward-traversing features. 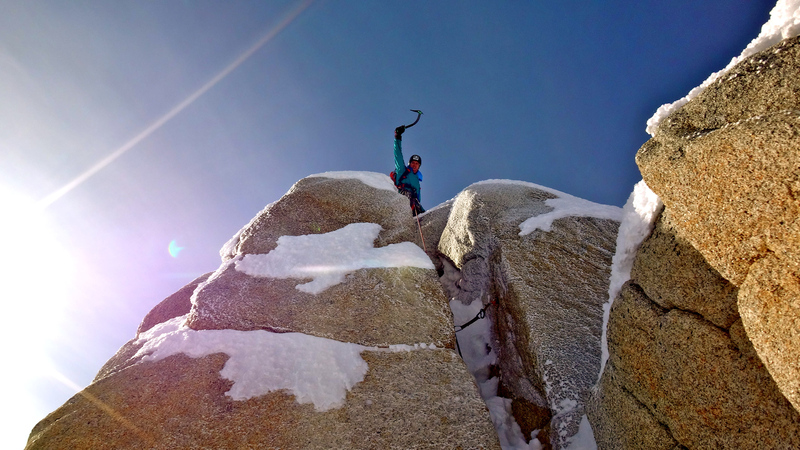 We climbed ice-glued, broken granite with tools and crampons, pounding in mini-Spectres and brass nuts to piece together steep rock steps and to access the upper snow ramps. Halfway through the day, while we were brewing up, clouds materialized before us, and the wind began to rage. Spindrift poured down the ice runnels above us. 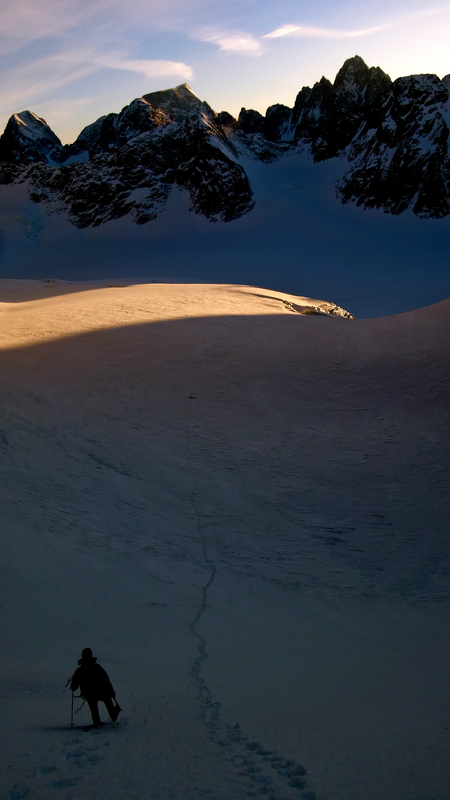 We hunkered down on an ice ledge the size of a single mat and spooned each other tightly under one sleeping bag. Many times during the next sixteen hours, we coughed with laughter at the audacity of the bivy. The isolated squall screamed through the night and blew itself out by morning. Unfolding our frozen bodies in the first hours of the day, we racked up and headed to the thin ice that had flushed with spindrift avalanches the day before. Although not incredibly steep; the ice was just an inch thick and blew out at any wild swing. Nonetheless, we made rapid progress to familiar ground below the top, recognizing features and gear placements. On April 23, we stood atop this wild and far-reached summit, again. As we rappelled the route, we had to leave most of the rack behind for anchors and the diurnal weather cycle slammed in again hard that night. 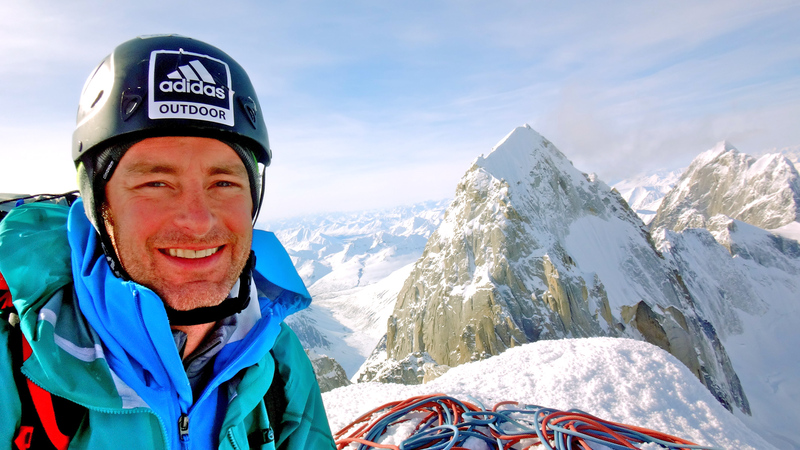 We completed the route at VI M7 AI4X A3 70� naming it "Westman's World" in honor of our dear friend, mentor and Captain, Mark Westman who holds a legendary presence in Alaskan climbing history. With support from the Mugs Stump Award we were able continue our fascination with this particularly magical part of the Alaska.